Two sisters leave their friends to go to a family birthday party. When the girls get to the party, they play games with lots of children and eat lots of good food and birthday cake. They have so much fun at the party that they don't want to leave! 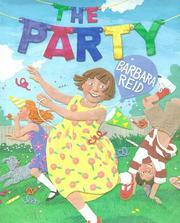 Reid, Barbara, “The party,” Children's Picture Book Database at Miami University, accessed April 21, 2019, https://dlp.lib.miamioh.edu/picturebook/items/show/7053.